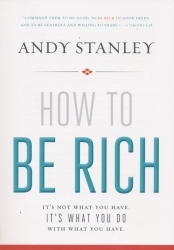 How to Be Rich by pastor Andy Stanley explores 1 Timothy 6:18. Andy biblically redefines what wealth is, how to use it, and helps you practice being rich so you will be good at it if you should ever be so fortunate. The early Christians took this command seriously. Generosity was the hallmark of the early church. They did for those who could not do or would not do anything in return. That was new. That got people’s attention. Is that how people in our communities would describe us? How to Be Rich will force conversation and reflection around the topic of what to do with what we have. Jesus could not have been any clearer. It’s not what you have that matters. It’s what you do with what you have that will count for you or against you in the kingdom of heaven. Andy Stanley will encourage you to look at richness differently, which might just lead our families, communities, and world to look at Christians differently.